The Big Idea: It can be so hard to know what to say or do when children’s emotions turn into difficult behavior (especially in the middle of the grocery store! ), but all parents have been there. This workshop offers some ways for parents and kids to handle tough moments by helping kids build inner strength and self-control. Print and distribute the “Breathe, Think, Do” cards to each parent. Ask parents to raise their hands: who hasn’t been sure what to do when their child is having a meltdown? Look at all of those raised hands! Reassure parents that they are not alone: it’s not easy when children’s emotions take over, but there are way to help kids learn to handle their emotions and behavior. Mention that when children are worried or angry, they need a parent’s help finding the words or actions to show their feelings. They may act out because don’t know how else to express themselves. Demonstrate and discuss the Breathe, Think, Do digital interactive and encourage parents to download it. 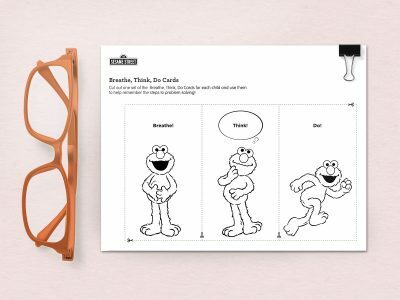 Distribute the Breathe, Think, Do cards and encourage parents to share the cards with their children at home after they’ve shared the interactive.